Assuming you are a normal person who enjoys sleeping in on the weekends, you're probably unaware of the fact that it's New York law that alcohol cannot be sold before noon on Sundays. But perhaps you're someone who thinks there's no bliss on earth quite like an 8am mimosa. If so, really? Also, there's some good news for you! A new report from the Alcoholic Beverage Control Law Working Group has proposed allowing restaurants and bars to sell booze as early as 8am. The group cites an NFL game played in London as an example of why the time restriction should be changed, because apparently people watch those. "The Buffalo Bills football team played a game in London. Given the time differences, the game was televised starting at 9:30am on a Sunday. Given the statutory hours of sale, on-premises licensees in the Buffalo area (or anywhere else in the state) could not serve alcoholic beverages to patrons during that game. Since the game was on a Sunday, licensees were not even able to obtain an 'all-night' permit to open earlier since such permits only allow businesses to continue serving until 8 am... The Working Group also discussed the common practice of consuming alcoholic beverages during Sunday 'brunch.'" 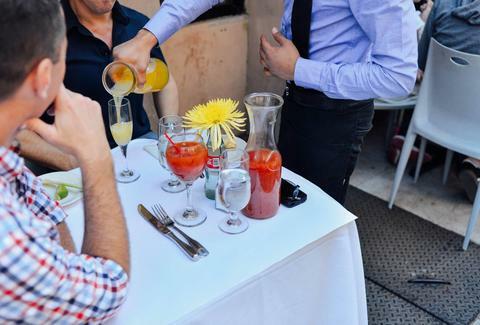 Obviously the most important thing to note here is that "brunch" was placed in quotes, because the Alcoholic Beverage Control Law Working Group has definitely never had five Bellinis while eating eggs Benedict. The group has also offered up an alternative option: to create "a permit system that would allow on-premises licenses to serve earlier on Sundays." The bad news is this may not happen very soon. A Community Board member from the group does note that his board "passed a resolution opposing both of the proposed options." WHAT DO WE HAVE TO DO TO BE ALLOWED TO DRINK WHILE HALF-ASLEEP?! Lucy Meilus is Thrillist's New York editor and does not enjoy European sports games. Follow her on Twitter and Instagram.